Very much like last week’s post, this week’s was initially a bit of a puzzle and I could not locate where the following original photo had been taken. There are no street names and no instantly recognisable buildings. 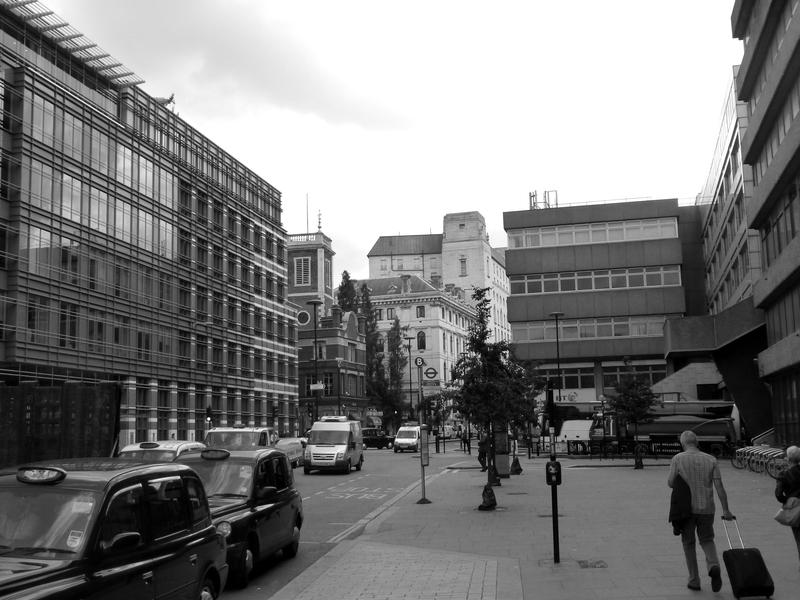 I could not recall anywhere in central London with two streets joining, separated by a long length of steps. My only clue was the rather dark sign on the right hand side stating Southern Electric and Underground. After checking the London stations of the Southern Railway I finally found where the photo was taken, but only because the buildings in the middle distance of the photo are still there, the rest of the scene is completely different. The foreground has completely changed, but what confirms the scene is the church tower (St Andrew by the Wardrobe) and the buildings around the church (the building behind the church is the British & Foreign Bible Society and the taller building behind that is the original Post Office Faraday building, opened on the 4th May 1933 and one of the main hubs for London telephone services). John Stow in his 1603 Survey of London was rather dismissive of the church of St. Andrew, with the single sentence “then turning up towards the north, is the parish church of St. Andrew in the Wardrobe, a proper church, but few Monuments hath it”. As well as the buildings in the foreground, even the level of the streets has been changed with the level on the right being taken up to that of Queen Victoria Street thereby removing the steps at the road junction. It would be good to think that some part of those steps were left and are buried beneath the current street level adding to the layers of history buried beneath the City’s surface. This small area is also a good example of how continuous development has reshaped London over the years, not just the buildings, but also the main thoroughfares through the City, and how the City has tried to manage the increasing volume of traffic passing within and through the City. Queen Victoria Street is the main street on the left of both photos. In the long history of London, this, as the name implies, is a recent road. The photos also demonstrate how the City has responded in recent decades when even Queen Victoria Street and the centre of the City were unable to manage the increasing volumes of traffic. In the original photo there is a road that drops away to the right. This is the original route of Upper Thames Street which, with Lower Thames Street was the main through road running parallel to the River Thames and connected to all the short lanes and wharfs leading down to the river. 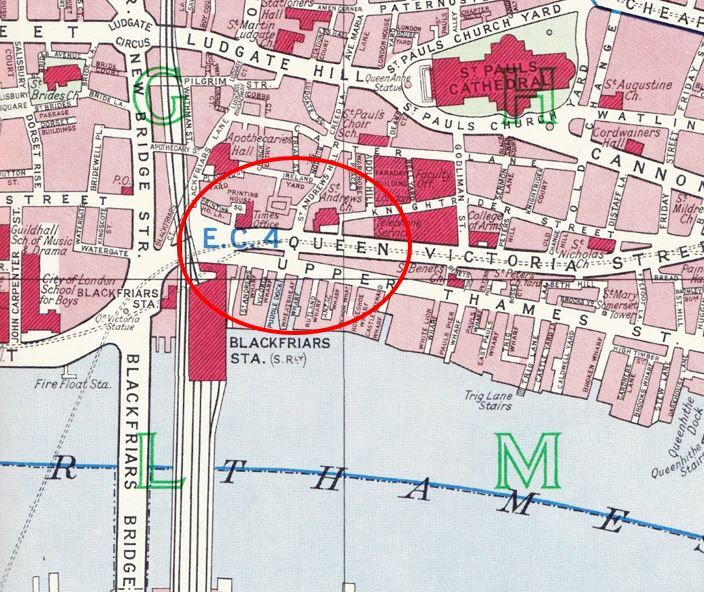 The following map is from Bartholomew’s Greater London Street Atlas of 1940, with the area of today’s post identified by the red oval. The original photo was taken in front of Blackfriars Station looking up Queen Victoria Street and the road turning right below the steps can be clearly identified in the map as Upper Thames Street. In recent decades the route of Upper Thames Street has been relocated to run far closer to the river, and rather than joining Queen Victoria Street, it nows runs underneath the river side of Blackfriars Station, underneath Blackfriars Bridge straight into the Embankment. The following Google map shows the area as it is now with the re-routing of Upper Thames Street. Not clearly visible in the 2014 photo is the road, just past the bus stop, that leads down underneath the complex of buildings around Blackfriars Station to Upper Thames Street. This road is Puddle Dock, a reference to the original dock that was on this site. Puddle Dock was also probably the landing place for the first Baynard’s Castle which was built in this area by William the Conqueror. The role of Baynard’s Castle was to protect the western edge of the city as the Tower of London protected the east. The first Baynard’s Castle lasted from the 11th to the 14th century following which it was replaced by the second Baynard’s Castle further to the east. Development of the Puddle Dock area started in 1952 when the Corporation of London offered the trustees of the Mermaid Theatre the lease of a bombed warehouse at Puddle Dock. The theatre opened in 1959 and is just under the building to the right on the road named Puddle Dock. The theatre has survived many attempts at closure and redevelopment and is now mainly a conference and events centre. Returning to the original photo, I find it fascinating to look at the people in these photos. The following is an enlargement of the group of people in the centre. The photo was taken on a weekend but note the very formal dress of the men. They have all probably just arrived on a train into Blackfriars and are heading off into the City. The man on the left appears to have a typical pushchair of the time. The adult and child on the right possibly heading down Upper Thames Street to visit the Tower of London? The streets around them must have seemed permanent. I wonder what they would have thought of the same location today? This entry was posted in London Churches, London Streets, The Thames on August 3, 2014 by admin. Great photo brought back a lot of memories. My dad was a docker as was my grandfather and uncles. When I left school in 1966 I worked at the bonded warehouse in abbey wharf upper Thames street so I was always up and down this junction. 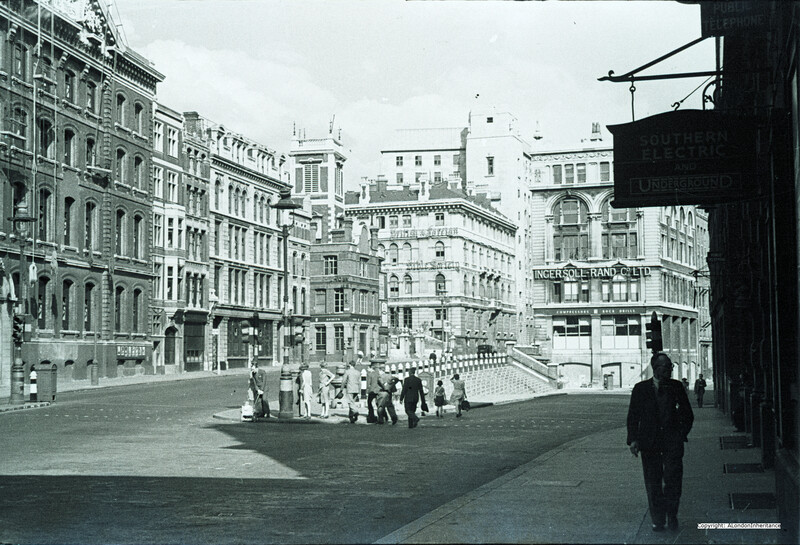 At 1:23 there is a panorma of the old Victoria Street, Upper Thames Street junction. I not have realised where it was if I’d not seen this post. Great information and excellent photos. I worked in the Bny Mellon building at 160 Queen Victoria Street. I lknow it used to be the Times Newspaper Building, but am not sure whet followed that.